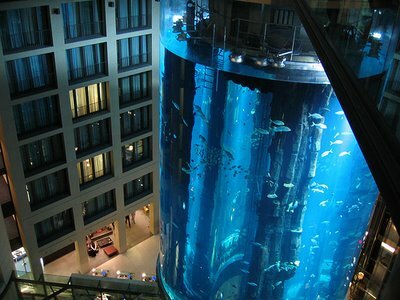 Placed at the lobby of the Radisson SAS Hotel in Berlin, the 25 meters high AquaDom is the largest cylindrical aquarium ever built. 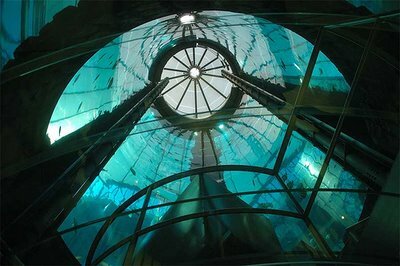 Filled with about 900,000 liters of seawater, it contains some 2600 fish of 56 species. 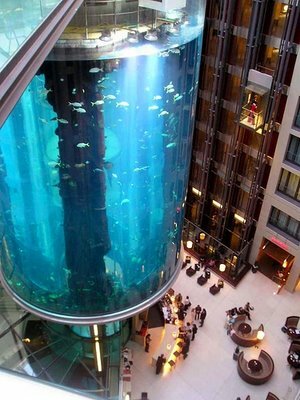 Combined with a vast amount of sandblasted glass, the giant AquaDom gives a transparent-like feeling to the lobby. 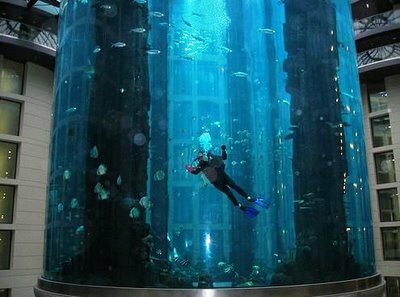 Guests and visitors are able to travel through the aquarium in a glass-enclosed elevator to reach a sightseeing point and restaurant under the glass roof. Two full-time divers are responsible for the care and feeding of the fish and maintenance of the aquarium. 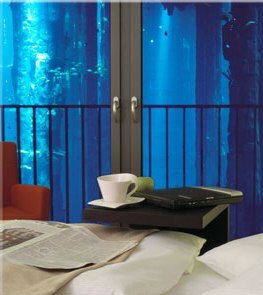 Some of the interior rooms and suites look out over the atrium, offering "ocean views" of the AquaDom. 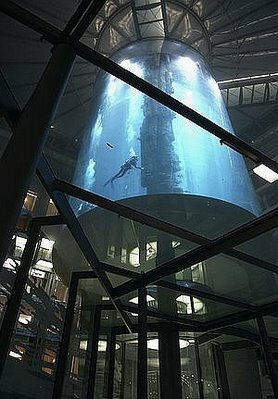 The AquaDom was opened in December 2003. 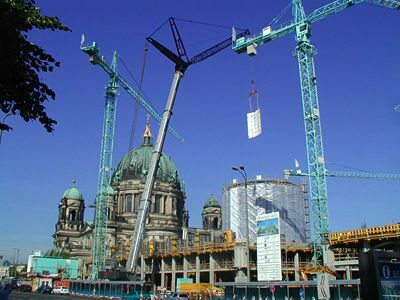 It cost about 12.8 million euros. 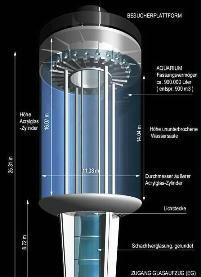 The acrylic glass cylinder was constructed by the U.S. company Reynolds Polymer Technology. 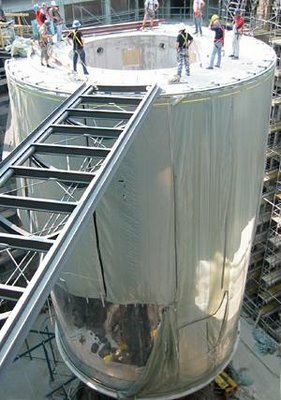 The outside cylinder was manufactured on-site from four pieces; the inside cylinder for the elevator was delivered in one piece. 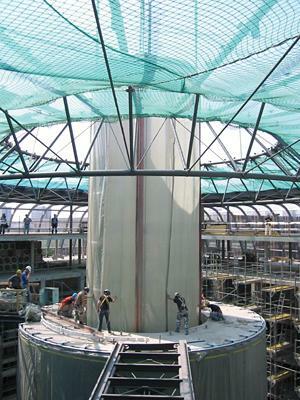 The Aquadom is the largest acrylic glass cylinder in the world, with a diameter of over 11 meters, built on a 9 meters tall concrete foundation. At night, with its neon sign blazing, the Jefferson seems to exist in a time warp, where the year is sometime in the late 1950s. Somewhere unseen, a VistaVision camera rolls film, a medium shot of the Jefferson's entrance framed in its aperture. On cue, a young Kim Novak exits the hotel, nervously looks up and down the street, then walks quickly in the direction of downtown, the rhythmic clacking of her high heels echoing in the chill night air. The most common building materials used for housing built during San Francisco's reconstruction following the 1906 earthquake and fire were brick, galvanized iron, terra cotta and stucco. 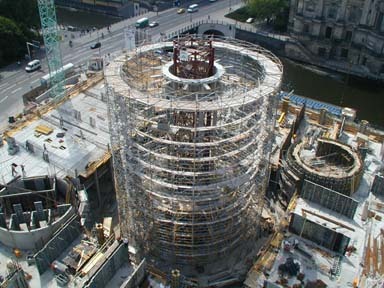 The real stonework used in the Marathon's construction places it a cut above the rest. The acanthus leaves and elaborate entablature that frame the entranceway to the Marathon are carved from solid stone. The window quoinings are made from molded bricks. A stone stringcourse divides the upper-level rooms from the ground-level storefronts. The only metalwork is the cornice, which has unfortunately been allowed to deteriorate past the point of being repairable in many places. The Marathon is an impressive building, but its owners have done little to maintain it. So it rots away; the possibility of restoring it becoming more remote with each passing day.